Azerbaijan’s defense minister, Colonel General Zakir Hasanov and the officials of the Defense Ministry, who are currently in the frontline zone, visited tank units, the press service of the ministry said in a statement on Dec. 27. 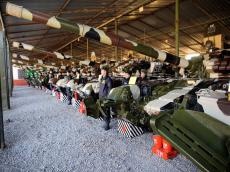 After checking the combat capability and the possibility of using armored vehicles, the minister was informed that the military equipment is in the state of combat readiness. After inspecting the training equipment in the simulator complex meant for the crews of armored vehicles to practice shooting and driving, the minister of defense highly appreciated the educational opportunities of the training center. It was noted that the center provides improvement of practical skills on management and combat use of armored vehicles by means of simulators. Having met with the military personnel involved in the training within the center, Hasanov conveyed holiday congratulations of the supreme commander-in-chief to the military personnel, as well as rewarded the distinguished servicemen.